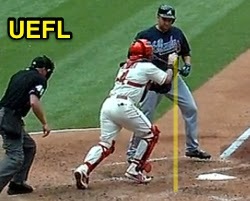 HP Umpire Ron Kulpa ejected Braves Manager Fredi Gonzalez for arguing a fair ball (bunt/out) call in the top of the 5th inning of the Braves-Cardinals game. With none out and one on, Braves batter Aaron Harang bunted a 1-1 fastball from Cardinals pitcher Shelby Miller near home plate, where it was fielded by catcher Yadier Molina to third baseman Matt Carpenter to first baseman Matt Adams, Braves baserunner R2 Andrelton Simmons out at third base and Harang out at first base. Replays indicate that after first bouncing off the ground in foul territory and gaining top spin, Molina first contacted the baseball while it was located over foul territory, the call was incorrect. At the time of the ejection, the contest was tied, 1-1. The Cardinals ultimately won the contest, 4-1. This is Ron Kulpa's first ejection of the 2014 season. Ron Kulpa now has -1 points in the UEFL Standings (1 Previous + 2 MLB + -4 Incorrect Call = -1). Crew Chief Eric Cooper now has 1 point in the UEFL's Crew Division (1 Previous + 0 Incorrect = 1). This is the 49th ejection of the 2014 MLB Regular Season. This is the 19th Manager ejection of 2014. This is the Braves' 2nd ejection of 2014, 2nd in the NL East (NYM 3; ATL 2; MIA, PHI, WAS 0). This is Fredi Gonzalez's first ejection since Sept 23, 2013 (Angel Hernandez; QOC = Y [HBP NCC]). This is Ron Kulpa's first ejection since Sept 15, 2013 (Mike Napoli; QOC = Y [Balls/Strikes]).